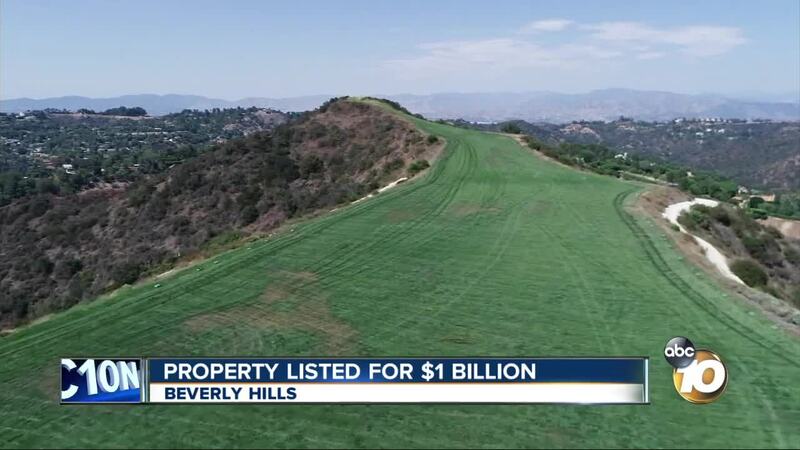 BEVERLY HILLS (KGTV) -- A massive plot of land dubbed "The Mountain" is on the market for a record $1 billion in Beverly Hills. The rare, 157-acre plot is perched atop the highest point in the 90210 zip code and listed for the first time in history. For a better visual of 157-acres - the listing agent says the compound could fit all of Disneyland Park and still have 57 acres to spare. “This is the only opportunity to own your own mountain that looks down at all of Los Angeles," says Aaron Kirman, President of Pacific Union International, Estates Division. "Our likely buyer for this property is an individual who wants to build his or her own compound." Owning the property has its advantages. The first being the views of Downtown Los Angeles, Orange County, Catalina Island and Santa Monica. All while living minutes away from the iconic Beverly Hills Hotel and Rodeo Drive. In the property's description, the listing agent writes, "the owner can build a soccer field, amphitheater, helipad, and a polo field side by side and still have lunch at the Beverly Hills hotel within five minutes." And the views aren't going anywhere, because the property is at an elevation that no neighboring trees obstruct. Uninterrupted views from Downtown LA to Catalina Island. Private road and one of the most secure locations in the world.